Little took over a team that went 0-10 in Class 2A in 1975 and led it into the 3A playoffs in 1976. A year later, the triple-threat quarterback guided the Gators to a 14-0 mark and the 1977 Class 3A state title, rushing for more than 200 yards in a 40-28 win over Brownwood in the championship game. 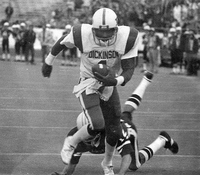 Lightly recruited until his senior season, when he was named first-team all-state, Little signed with Texas (1978-1981) and in 1979 became the first black quarterback ever to start for the Longhorns. In his two seasons as the starter, Texas posted 16 wins and went to two bowl games. He also led the Horns in receiving after moving to wideout as a senior in hopes of improving his NFL stock. But he went undrafted and signed with the Canadian Football League’s Ottawa Roughriders in 1983, where he played four seasons before a knee injury ended his career.